All the business world is abuzz about New Order shares. The market consensus: BUY BUY BUY! Lord Jasta is the latest new shareholder to buy in big. His purchase of 2,770 shares sent us over the 847, 848, and 849 billion isk marks. Not for nothing, it also earned him a Triple Supreme Protector's Tip of the Hat™. A fine feather for any cap, that. Andrei Alpha decided to get in on the action this week, too. 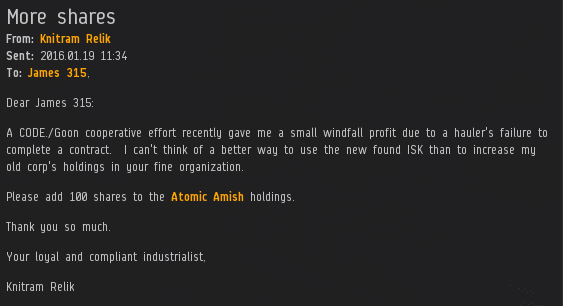 His first-time purchase of 250 shares sent us over the 850 billion isk mark and earned him a Supreme Protector's Tip of the Hat™. It doesn't take an expert market analyst to see where this is all headed. If you haven't purchased a stake in highsec's future, now is looking like a pretty darn good time to do so. I would like to give a personal shoutout to agent Alt 00 who was patient and gave me guidance. Thank you, without you I wouldn't have taken the plunge to break away from my sedentary mindset and live a little. I love what you do, how friendly and polite you are and insightful. 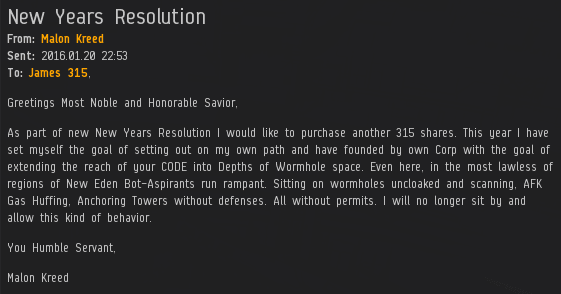 My purchase of 315 shares was well spent! Is Your Child Ready to Mine?